Ground beef is made from leftover cuts of meat, such as steaks and roasts. The package labels will tell you from which part of the cow it came: Chuck, round, or sirloin. These labels also specify the lean-to-fat ratio, which is the ratio of lean meat to fat, not nutritional information. Typically, ground chuck has 80 percent lean beef to 20 percent fat; ground round is "85/15," and "90/10" is ground sirloin. Packages of ground beef may also be labeled as "certified organic" or "grass-fed." Certified organic means the cows had access to pasture, were given pesticide-free organic feed and were raised without antibiotics or growth hormones. Grass-fed is defined by the USDA as livestock fed only on grass and forage. This does not eliminate the use of hormones, antibiotics or pesticides, however, or mean the cows were on pasture all the time. When buying ground beef, look for clear cellophane wrapping and be sure there are no tears in the packaging. Also always be sure to check the expiration date. The meat should be a bright red cherry color with the fat marbling uniformly mixed. If it is brown or gray on the outside, that means it has begun to spoil. Don't worry if when you open the package of beef it is brownish in the center – that is due to a lack of exposure to oxygen. Bulk ground beef is often sold in round chub rolls, vacuum-packed in a wrapper you cannot see through. With this type of packaging, you are pretty much at the mercy of the market, because you cannot see the meat to make any visual judgments. Since it is usually the best bargain, pay attention to the expiration date (and cross your fingers). For most recipe applications, including hamburgers, ground chuck is the best choice. Chuck comes from an area of the cow that is more exercised, giving it more robust flavor. It has enough fat to make the beef juicy, but not so much that you're left with very little meat when cooked. If you are looking for a leaner meat for a recipe, choose ground sirloin or ground round. Just keep in mind the longer you cook it the drier it will become due to the lower fat content. Packaged fresh ground beef should be stored in the coldest part of your refrigerator and used or placed in the freezer within two days. To freeze ground beef, remove it from the market packaging and divide into specific recipe portions (1/2 pound, 1 pound, 2 pounds, etc.). Wrap in plastic wrap or foil and place in airtight plastic sealable bags. Freeze three to six months. 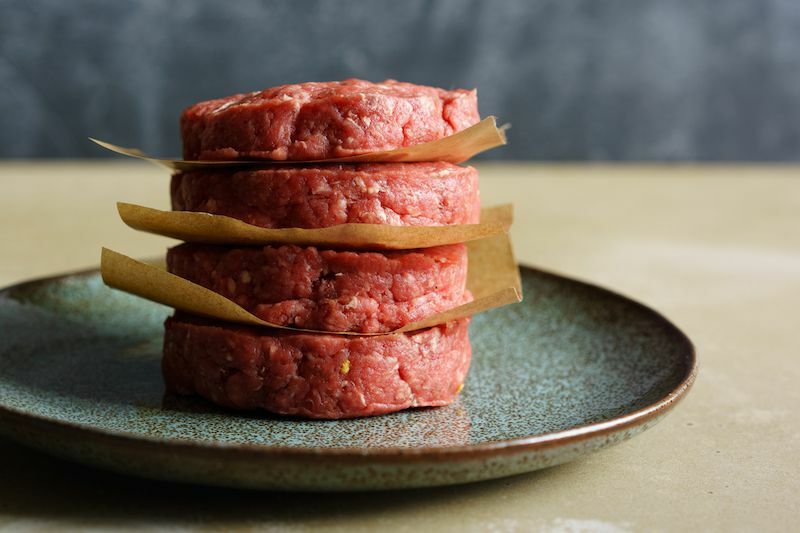 For quick meal prep, you can form the beef into burger patties, separate with butcher paper or plastic wrap, seal in a zip-top bag and place in the freezer. Plan in advance to thaw frozen ground beef in the refrigerator. You can also safely defrost in the microwave; since the edges may begin to cook before the center is thawed, it is best to remove the outside of the mound of beef as it softens. If you are so inclined, you can grind your own beef using a food processor.